Most treadmills provide you feedback about your workout, including approximate calories burned, speed, elapsed time and distance covered. Consumers are often leery of the accuracy of this information. The calorie and fat burning data may be inaccurate, since the treadmill does not have enough information about the user. However, distance information is one of the more accurate data pieces on a treadmill. 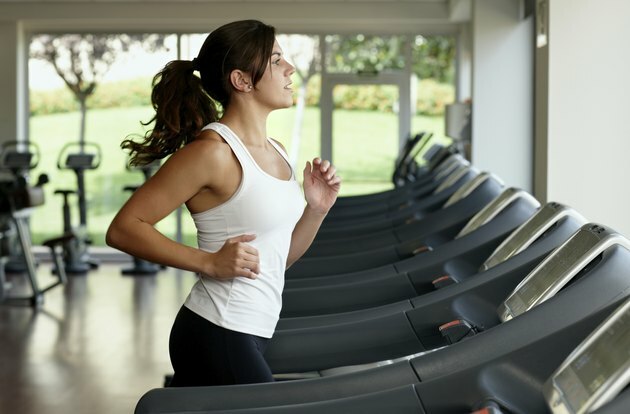 Treadmills measure distance to provide you with one method to track and improve your fitness. If you want to increase your fitness level, you need to continuously challenge your body. There are several ways to do this. You can run for longer periods of time, run faster, or run farther. The distance data on a treadmill tells you if you're running farther. The distance feature is important for measuring the effectiveness of your training, whether you are a beginner or a serious runner. Using distance, you can calculate your pace. Divide your distance by your time to figure your minutes per mile. Runners use this number to gauge their overall improvement. They strive to decrease the amount of time it takes them to run a mile. The distance reading on most treadmills is accurate. Distance is measured by the revolutions of the belt. The belt is a specific length and the treadmill records how many times it has covered this length. Whether you're running with the treadmill set at zero or at an incline, the distance covered remains the same. However, the intensity of your workout increases as the incline becomes steeper, because you're running "uphill." Many treadmills can be programmed to operate in metric or U.S. units. The metric measurement for distance is kilometers and the U.S. measurement for distance is miles. Make sure the treadmill is set to measure distance in your preferred units. Although the distance reading on a treadmill is accurate, this does not mean all the data is accurate. A public relations manager from fitness equipment company Precor, Jim Zahniser, commented in a Washington Post article that the speed and distance readings are "straightforward and fairly accurate." However, the calorie counter is set to calculate the metabolic rate of an average exerciser, not you specifically. Therefore, the calorie information is an estimate, and is not as trustworthy as the distance information.